With its subtropical climate year-round, the state of Maryland deals with a lot of water and moisture. This, in turn, can lead to many foundation problems within homes. Cities like New Carrollton, located in central Prince George’s County, are just as susceptible to foundation damage. Problems such as wall rotation, cracked bricks, displaced moldings, cracked sheetrock, and misaligned doors and windows can occur when foundation damage is present. If these issues are addressed early enough, you can save your home and avoid major financial devastation. What causes these foundation problems to occur? 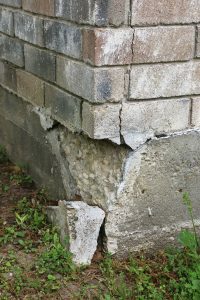 Let’s identify the causes of foundation damage and find out your options in foundation repair for New Carrollton homes. As you may have guessed, water is the main enemy in expansive soil problems. Either there is too much water, causing the soil to swell, or there isn’t enough, causing the soil to shrink up. When this shift in the amount of water in the soil changes uniformly, there is a small chance of any foundation problems occurring. However, this is rarely the case. Most of the time, only parts of the soil heave and settle, causing cracks and other damages in the foundation. When there is a gain in soil moisture, this is the most serious threat. The swelling potential of expansive soils is much greater than the shrinkage potential. Moisture gain can come from various factors, such as plumbing leaks, subsurface water (wet weather, high water table, or surface water), and poor drainage. Poor drainage is a major contributor to soil moisture gains. This is why many people seek foundation repair in New Carrollton homes. Having water damage requires immediate attention. As a homeowner, you can check if your New Carrollton home is in danger by inspecting the soil around your property. Check to see if the soil is unnaturally wet, assuming that no rainfall had recently occurred, or if it’s unusually dry. Water damage may also be invisible to us. In order to identify any invisible leaks, shut off all water-based appliances, check the water meter and record the exact readout. After waiting six to twelve hours, check your water meter again to see if anything changed. If there is a change, this may mean that a leak exists behind the wall or underneath the floor of your home. Issues that have originated in the foundation can travel to the upper levels of your New Carrollton home. These upper level issues will usually come in the form of sagging floors or warped ceilings. Exposed gaps where the interior walls are supposed to meet with each floor and ceiling is also a clear sign of foundation damage to the home. Using a level tool, you can verify whether or not the slope is consistent on each floor and ceiling. If a level tool is not accessible, you can use a tennis ball to examine foundation problems. When placing a tennis ball in random locations on every floor, the ball should never move. If it does foundation repair in New Carrollton is needed. If you’re in need of foundation repair in New Carrollton, contact our reputable foundation repair company for all of your needs. AA Action Waterproofing has worked in the Maryland area for nearly 30 years, performing various aspects of home improvement. Don’t let your home continue to suffer. Failure to address these problems will only cause more problems and cost more money down the road. Visit our website today and see what our services are all about!